For information on our fees and booking a sale, please contact Shelley at 405.612.2016, or email. I will call and visit with you about your needs. Please remember that it takes at least 3 weeks to put a sale together. We start advertising two weeks ahead. As soon as you know you need or want to have a sale, please contact us. We try to accommodate everyone but we are usually booked weeks ahead. About sales at our building, every sale is different. We do not bring leftover items from other sales. We typically have a waiting list of families wanting to use our facilities. Sales at the building are combined and color coded to track each families items. Some families may only have a few items while others may be a complete estate. Why use our building? Some areas are not conducive to host an estate sale. Perhaps you don’t have enough for a sale on your own. There is not enough time between closing on the home and when we can conduct your sale. You do not want strangers in your home. We do not move or transport your items. 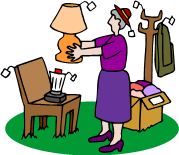 We can suggest or help arrange for a mover to move your items. The set up fees and advertising are prorated among the estates. Every estate is assigned a color. Cards, stickers and tags are attached to the items. The cashiers will write down or pull the card, tag or sticker as you check out. This takes a few minutes longer but ask that you be patient. We have an ample supply of bags and paper to wrap your items. Loading and hauling is the responsibility of the purchaser. We will certainly do our best to help you load our items. Our building is 40 x 60 fully insulated with central heat and air with a covered L shaped porch. We use this porch as well as the landing outside the two overhead doors on the day of the sale to display items. We ask that you do not shop until we open the doors. Typically, sales at the building run 12 noon to 6 on Friday, Saturday doors open at 9 AM, closing from 12-12:30 for lunch. We try to close at 2 but occasionally will stay open a little longer. We can operate up to 5 registers during the sales. We accept cash, checks or credit/debit cards. What happens to the items that do not sell? The family has the option of keeping their items. We can donate what is left if we do not have a Buy Out (buy out–everything that is left goes for one lump sum) or we can send to an auction house. These details can be worked out as it gets closer to the sale. Who works at The Tag Ladies?